Do you identify with a compassionate, noble warrior that fights for a worthy cause, or perhaps you are charmingly more mischievous and playful? If so, Marvel Day at Sea offers the legendary Super Hero and Super Villain adventures you seek. To help you unleash the mythical Norse god inside of you, we cooperated with Disney fashion expert Leslie Kay – creator of the DisneyBound blog – to provide inspiration and tips. Foes can call a truce and put their sibling rivalry aside for the worthwhile cause of bounding this fabled duo. Your Thor, Norse god of thunder and lightning, is strong and self-assured, with accessories befitting Asgard, of course including an enchanted hammer. Or, do you aspire to be a roguish trickster, burdened with glorious purpose of spreading mischief and madness? You’re such a Loki, you were made to rule! Styling tips from Leslie: Thor is mostly charcoal grey from head to toe with silver accents. I suggest giving any character with a cape a cardigan or jacket in the corresponding color that can be styled either unbuttoned or unzipped. Silver watch and bracelets lend a feel of his armor. Mjolnir hammer accessory is a nice touch. 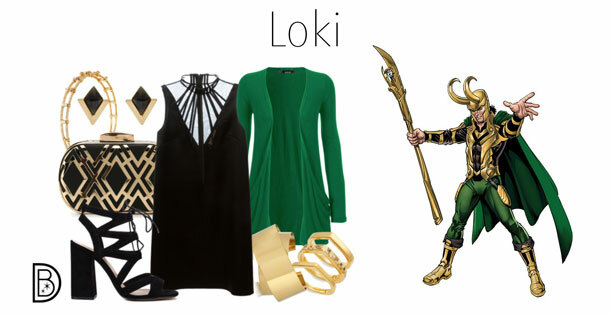 Styling tips from Leslie: Green cardigan or kimono for Loki’s cape. The details in his outfit are very geometric so try to find items with a similar pattern either in design or within construction. In place of gold horns, a gold headband works well. Loki’s gold cuff guards on each wrist can be achieved with wide gold cuff bracelets. For more ideas to express your Super Hero “character”istics and to get a glimpse at what you can expect during this epic event, keep following along on the Disney Parks Blog as we reveal more Marvel Day at Sea fun in store.